I am deeply saddened that a majority of California voters were misled to believe that the early release of prisoners from state prison would only apply to truly nonviolent crimes. The initiative system must be changed immediately to ensure in the future, that voters are given the truth by an objective and independent third party. Sadly, an individual or group with millions of dollars and a few nice sounding buzzwords can buy the necessary votes to create a bad law by crafting a message that sounds great but in reality is not truthful. Much progress made in the last 40 years in California to hold career criminals accountable has just been thrown out the window. Our office remains committed to our mission of pursuing justice for victims of crime and holding offenders accountable. 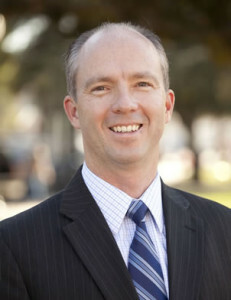 Dan Dow was elected as the San Luis Obispo County District Attorney in 2014. Dan Dow is right. The crime wave began with realignment. Now it will merely escalate. SLO City isn’t really safe anymore, just look at the police logs and robberies, burglaries, etc. We pay our police enough so why can’t they be caught? Answer: Why bother? They will walk anyway. Oh, the patriot act is patriotic said no one, lets support data collection, search and frisk etc etc etc. Boy. Read your google scholar, thats my data kids! Unless your white and wealthy driving that nice nice car! And rich people make the laws, talk about idiocracy to posts here saying money makes laws- no sht bro! common friggin sense. It’s very unfortunate that people don’t do diligent research. Proposition 47 was dubbed the Safe Schools and Neighboorhood Act. It’s done nothing to prevent career criminals from repeating the same crimes because they know there is no real punishment. It is an infuriating cycle! How many of them are back committing crimes because the combination of lack of viable job skills and the heavy load of having a criminal record makes it very difficult to survive otherwise? Yeah, they should have thought about that beforehand but if they were able to think that far ahead maybe they would not have fallen into a life of crime to begin with. Some will never reform but there are enough who would to be worth the effort to try and punishment is only one part of the solution. Vietnam for oil?? iraq for oil, osama a spy? Germany for IBM and Coca Cola ww2? Failed African warlords funded by USA, Guatamala’s usa funded genocide? For hecks sake out of logic??? Sadam appointed then killed????? Thank you Dan for speaking out the truth regarding Prop. 57 and the fact that big money is the dirty words of politics. Like they say “just follow the money”. To all of you that think this is a good idea just remember that when these so called “non-violent” people are released from prison that they have received no job training in the criminal system with the exception of how to be better criminals. Consequently the only job skills that they will bring to our communities is how to be better criminals. The crime wave is on its way. It’s funny how political lifers talk about how bad all the money influence is but only when it is on the other side, When all that money is working for them, they are as quiet as a mouse. Way to go California. Put criminals on the street and make it harder for law abiding citizens to defend themselves from them. Talk about out of touch. You should be your own country. Well, since they will be back on the streets, maybe we should look at ways of actually trying to reform them while they are in prison/jail. The only education many of them get there is on how to become better criminals. I do agree that it was stupid to make it harder for us to defend ourselves against them. This county supports Bail-Bonds- Washington D.C has banned them. I dont see John Wallace and the Wallace firm getting sued for firing whistle blowers, dumping waste into Avila etc. Seriously, shut up. No one is paying your insane salary to spout your mouth either. I am sick and tired of politicians speaking out of place when not asked. Stop, for god sakes stop. Who the heck cares your upset. Talk to your wife, therapist whatever. Stop using media as a means to try to attempt to threaten and sway people. Its practically criminal, and might be. billygatez thank you for your comments. You have just exposed yourself to what a simple explanation of ignorance is. I hope that you do not become of victim of your ignorance. Oh lord. I hope not; r u kidding. Im not kidding. And let my education be my demise! muwahaha! Im so exposed, im naked! and informed ignorance is intellectual spiritual bliss! Im so exposed im running down the figurative street naked screaming random things playing trumpet touting a flag stating “Make America Great”! I agree with Dan and will go a little further as seeing this to be a vote for legalizing crime. I factually know that in Kern County thieves can be in a catch and release category if their crime is under $1000. They know this so they work within that threshold and or use the lame excuse for breaking and entering as seeking shelter. I support the criminal justice process not an election to free up someone’s budget. There has got to be a productive way to satisfy both, labor camps, community projects, Caltrans? non-violent” crimes. Did you even read the list? Have you not seen the statistics since prop 47 passed?